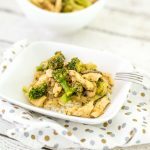 Ginger Chicken + Broccoli is a super easy weeknight dinner that’s paleo + gluten free! Add in your sliced onion + mushroom, let it all get cozy together. Add in your chicken and cook it almost all the way through. Add in your cooked broccoli, coconut amino, lime, cumin, ginger, salt + pepper. Cook until the chicken is cooked through and the broccoli is warmed through. Taste test to see if you need more lime juice or ginger. Serve over cauliflower rice, white rice, or a salad and enjoy!